The process for creating a group board is very easy. It can be done with a new board or an existing board. Find the board you would like to make a group board on your main account page. The people you invite to pin to your board will then see your invitation at the top right side of their home feed. I create a board and invite 10 friends to contribute to it. Sounds like a win-win situation right? It can be, when approached cautiously. Pins that are pinned to newly created group boards will be visible to those who follow your entire account. Since it is possible that only specific boards can be followed sometimes the number of followers of some boards is lower than others. So, if you have a very popular board with a large following that gets lots of repins, a newly created board with a lower number of followers might take time to grow in popularity. 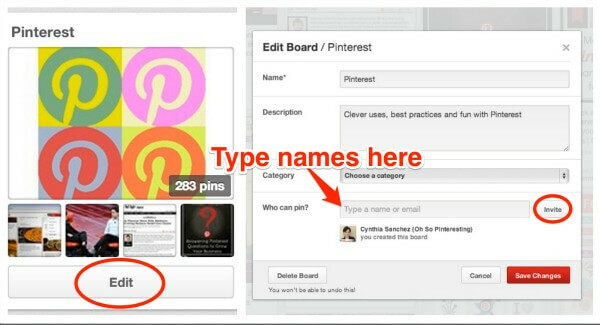 When creating a group board take advantage of the board’s description area to set up guidelines for pining such as what kinds of pins or how many per day. If you’d like to make your board open to requests to join you can also let people know how to contact you to request an invitation to the board in the description. Be sure to read below before sending the invitation. Before inviting someone to pin to your board make sure you can rely on them to pin quality pins that are relavant to the topic. If you don’t already have an existing relationship with them check out their account and their pins first. Do they only promote their stuff? Do their pins lead to the original source? Does their content and audience fit inline with yours? Another reason to be careful of who you invite to your group boards is that they can invite others to join the group. That nice sweet person that has lots of gorgeous high quality pins that you invited might not be as savvy as you and invite another pinner who has lots gorgeous pins that actually lead to a spam site. Below is an example of the options I have when I click on the edit option for a group board I was invited to pin to. Notice that I can invite anyone I follow and that the person who invited me was not who invited the person listed beneath me. We all want to feel included and it’s great to be invited to things right? If you’re invited to a group board check it out first. You wouldn’t attend a party that your were invited to and take your customers with you with out checking things out first right? In the example below, this group board has over 1290 contributors. If I accepted that invitation and even half of the people are just somewhat active in pinning to that board, I could expect to find my feed clogged with pins from this board. I have found that most boards with a large number of contributors, that it quickly turns into an out of control spam fest. There was a time when my feed was clogged with hundreds of pins of women’s scarves for sale. Not cool! If you join a group board your existing followers will not see what is pinned to that board. However, if they go to your main profile page with your boards listed they can choose to follow it there. New followers of your entire account will not automatically follow the boards you were invited to contribute to. If someone finds the group board on your account and follows it, it is the creator of the board that gets the boost in follower numbers not you. The creator of the borad is always the first image on the left side next to the number of contributors. If you come cross a nice, non spammy looking board and are interested in joining, don’t be afraid to reach out to the pinner. If the board’s description doesn’t offer a way to request an invite, you can comment on one of their pins or reach out to them on them on their site. If they have their Twitter or Facebook account linked, you can reach out to them that way too. If you’re creating or joining a group board give it some thought first. Does it fit into your Pinterest strategy? Will the content pinned to that board be interesting to your followers and attract new followers? Will it ultimately bring traffic back to your site? If you find yourself in a bad situation, remember, you can always leave the board or remove pinners who abuse your hospitality. If approached carefully and with purpose, group boards can be a great way to build your community, bring fresh content to your followers and expose your content to potential new followers. Do you participate in group boards? What have your experiences been? “New followers of your entire account will not automatically follow the boards you were invited to contribute to.” So, no one who follows my boards is automatically opted-in to the group boards I belong to-they have to choose to follow them? Or am I misunderstanding this? How does the number of followers of a group board get calculated or do you know? Great tip about figuring out who owns the board! So many say to contact them to join but don’t say who or where they are. Now I know. Is there a way to analyze traffic from a group board – to see if creates new followers for me or visits to my site? Some of my pins to group boards have very good repin numbers but I’m not sure if they convert. I see incoming pin links in my blog analytics but it’s quite a task to click back on them and figure out where the traffic originated. Is there a tool to help with this? I have a feeling I should reduce my participation in group boards but I want to find facts/numbers to back my decisions before I cull the herd. -Automatic opt-ins: Yup, you understand correctly, no one automatically see the pins from the group boards you join. -Number of followers to a group board: Any one that follows the board goes onto the follower list, the originator of the board gets the credit to their overall follower number. Is there a way to analyze traffic from a group board: I don’t think there is a tool to differentiate traffic from specific boards at this time. Thanks for your questions Mellissa, It would be great to hear what you find in your research, please keep me updated. Hi Cynthia! I have initiated a few group boards, and have been invited to a few and I am definitely seeing an upswing in the number of new followers. I find it comforting that if things get out of hand, I can quickly and easily leave that board, and I also like the fact that on my own boards, I can delete any pins I do not like. So this means that I have the added burden of monitoring these boards daily, PAH! I find it interesting, however, that of the top 50 Pinners on Pinterest (ranked by the number of followers) very few of them participate in group boards. . . in fact I identified only six. Maybe this is because they don’t need to any more (! ), but, the fact is that these are the people I’d really LOVE to have join one of my group boards! They never respond to my invites, so I guess that I’d better move on down the pecking order, eh? Yup, creating group boards do require time and attention to make sure that the quality remains high. I wish you could set up filters to minimize the work, maybe someday…. As far as reaching out to the more influential pinners, I agree it would be great for those with millions of followers to join and repin all of our stuff but I’m sure they are bombarded with invitations daily. As you said, it might be better to move down the pecking order and be strategic in who you invite. Someone that has a connection to your niche or has a similar interest might be more inclined to join the group board and repin your content. Hi again, Cynthia! Any ideas on how to encourage those who join group boards to pin to that board? I have a good number of people who have joined my boards, who never once pin to that board. Apparently this is not uncommon, as it is a quick and easy way to fill your Pinterest presence with quality boards, with lots of pins. But, for me, the goal is to have participation. I hate to have to delete pinners who have joined the board, but hey, this is SOCIAL media, which means participation is part of the equation! Would love to know your thoughts, thanks! I know for me, I sometimes am so focused on my main boards that I forget that I have group boards. You might try to comment on some of their pins and give them a gentle reminder like “Hi, I noticed you pinned this awesome______ pin, it would go great on our __________ group board too. I’m sure the other members of the group board would love to see it too. See you on the group board” or something along those lines. That’s a good idea, and I will give it a shot. Thanks so much! Thanks for the information on group boards,as a “newbie” to Pinterest could you expand on the “following” process,what is the considered the “norm” for “following” is it a person,their board(s)the boards they are “following”? I see it could definitely get out of hand, I have started by repining some pins which has brought some followers, but do I continue just to do this or can I exponentially grow followers by mass following boards such as using the “Follow All” button or be selective, is it just a numbers game? to get the most people to visit my website. Following should be selective to boards and pinners that would be best for meeting your goals. If you’re trying to get people back to your site, following and engaging people who don’t have an interest in your type of content probably wouldn’t be the best approach so I dont recommend mass following. I just got switched to the new notifications view and I noticed that my group board invitations (ones I was mulling over) are no longer visible. Do you know if these now appear in the notifications stream or are they somewhere else? I can’t find them! Update – after writing my previous comment the group board invites have reappeared on my left sidbar. Must have been a temporary glitch…. Yup, there have been lots of glitches lately. Maybe its a sign of more changes coming 😉 Glad it worked out for you. great tips in the post and comments – thank you. I think I’ll check out some group boards ‘with caution’. Thanks Ali, let us know how it goes. design and style has got great features. Agreed. These MUST be approached with caution. I manage the Pinterest account for my company and noted that within five days of inviting extra contributors, my groups boards were FLOODED with pins from “friends of frends” that didn’t reflect the feel of those boards at all. Lesson learned. Oh no, that stinks! We’re all learning together. Thanks so much for stopping by! Is there a way to add people to a group board who do not follow you? I have set up a group board but can’t add anyone who doesn’t follow me. Thanks! If you have their email address, you can invite them that way. If you have their Facbook or Twitter account linked to Pinterest you could contact them there too. Thanks for writing such a helpful post. I’ve been on Pinterest for a while, but haven’t done anything with group boards yet. Thinking that joining some big boards with a lot of followers will get my blog content more exposure, but I also get that they will get lost in the shuffle that way too. I may try creating a few boards of my own too. Need to really think about that before I do anything though. Thanks for all the food for thought. My pleasure Karen! Best of luck to you with group boards. Hey Cynthia! Great writeup! Do you have any idea why some pinners can be added yet others can’t even after you follow each other? Even after refreshing the board page. Thanks! Hi Abhi, if you’re pard of a group board you should be able to assign your pins to that board just like you would any other. Thanks for your question. Hi Cynthia. Thanks for your nice article. I have a (stupid??) question…. If I see a group board I would like to join and I reach out to the owner of the board, do I need to follow every single one of their boards in order to invited? I’ve been getting responses that “I need to follow them first.” But I have followed the group board, + one or more of their boards. I’m a little confused. Thanks! You should only have to follow the group board. It seems that there are some changes happening to Pinterest, some of my accounts have some features that others don’t. This might be why you’re experiencing this glitch. You could try to follow all of that person’s boards temporarily, join the group board, then unfollow the ones you’re not interested in. When you mention that your followers can see what’s pinned to a group board, does that mean they see what you pin or is it what everyone pins? I’m wondering how bad the impact will be when some where down the road we get a random spammer. Thanks for the insight on how this works. I was really wondering. Very helpful insights. I’m planning to set one of my Pinterest board to allow group pinning, and much of what you’ve explained will come in handy. This question though… If my followers don’t want to become pinners in my new group, what tactics should I use to increase the number of people who want to pin on the board? Are there good Pinterest-themed sites that provide exposure to groups or anything? You could always use your other networks like Facebook and Twitter to invite people to participate. As far as sites that provide exposure I cant think of any but PinGroupie.com does index them for people looking for group boards to join. Hi Vicki, thanks for stopping by! If I have created a group board and the pins have been re-pinned, then delete the group board, the pins WILL still be available where they were re-pinned, right? What about any pins NOT re-pinned: if the board is deleted, will those pins be deleted too? Yes, you’re absolutely right. The repins of the deleted board will still be available. Each pin on Pinterest has it’s own unique URL if it has not been repinned and it is deleted the it will be deleted too. Thanks so much for you question. Sorry for the delayed response. I was invited to a group board last year. I just found out a while a go that I was blocked by the board creator & have no idea why. This woman 1st approached me & commented about how beautiful my boards were when she invited me. Funny thing is, I have pinned only a handful of things to the board & have repinned very few things from the board. It’s even been months since I last pinned anything. My computer crashed 2 months ago & I’m just getting back on my pinterest when I found this out. It is baffling! Hi Cynthia! This was such a great post and very informative, but I do have one question. If I leave a group board that I was invited to pin to, will I lose any followers? I guess what I’m really asking is if the followers of a group board I’m a part of are counted in my personal number of followers. Thanks! The way it seems to work is that you will only lose the followers that only followed that group board from your account. I haven’t tested this since earlier this year. I’m not sure if the process has changed since the updates that happened over the summer. I’ve been starting to use group boards, but with some hesitation. While I want to connect with my followers and share my enthusiasm with them, I have so far been very careful about the images I pin to my boards, pinning only pictures that are high quality and which really fit the idea behind each board. Should I worry about inviting people to my boards who might lower the quality of my boards by pinning not so great pictures? I worry that my boards might become less interesting and valuable to new users if this happens. Does anyone have similar concerns, or ideas about how to deal with this? Hi Cynthia! I recently scored a place on a group pinterest board with a major women’s retailer. At first, I was thrilled, as I literally watched my pinterest followers rise! But, I did not ask about rules for pinning on the board and assumed as long as I pinned photos of the company’s products I was ok. But, the company, without warning, removed me from the board as they said I put pins up that didn’t link to their website. I was upset at first, but now my pinterest stream is not clogged with the items from that board & I am not so focused on their brand’s items & can refocus on my own content. My advice to everyone here, is to ask for pinning rules to the board, if none are given, as none were given here. This was just my experience, though I felt the brand handled it badly, by not just letting me know all pins needed to link to their site. Hi Cynthia! Thanks for the very helpful article. I had a question I was hoping you could help me with that I can’t find an answer to anywhere. I am the owner of a couple group boards and there are some pins I’d like to delete due to their irrelevance, but I can only figure out how to delete my own pins. Any suggestions? Thanks for your time! I’ve been traveling for work quite a bit lately so I apologize for my delay in responding. As the owner/creator of a group board you should be delete any pin. I have had to do some deleting recently form my boards for for the same reason. If this problem hasn’t already been resolved, try doing it from another browser or from another device. My feed is full of pins from group boards that I do NOT follow/belong to. So why am I being bombarded with them and how do I make them disappear?? To help clean up your feed go into your account settings and adjust your personalization option. You can also clear your recent searches. Hope this helps. Thanks for sharing this. I’m creating a group board for my profile and I hope it never turns out to be a spam fest. I’m actually realizing that a lot of managing is needed but good thing is it can take maybe an hour of your day so I’ll try out the group board and see how it goes. I have been invited to several group boards and I think I might also join some of them to see if it benefits me in terms of getting repins for my stuff. Since there aren’t any filters,maybe keeping the number of pinners in a group board to a minimum would help? What do you think? Hi Cynthia is there a way to remove people from boards without blocking them. When there are a lot of contributors and you cannot find them in the long list? if your brand reflects your focus on customer service, don. Studying references of past trends and current successful logos.